Het Steen ('The Stone') in Antwerp. It may look like a castle, but in fact it's one of the corners of the mediaeval inner city of Antwerp. When the banks of the river Scheldt were straightened and a large road was constructed along the river the (dilapidated) old city was torn down except for the oldest part, which was originally erected by the Vikings. Scale model of the original mediaeval inner city of Antwerp. 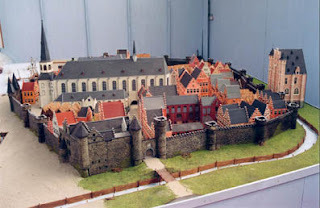 Nearly everything has been demolished, except the left corner (Het Steen) and the large building at the right side of the picture (the Butcher's Hall). 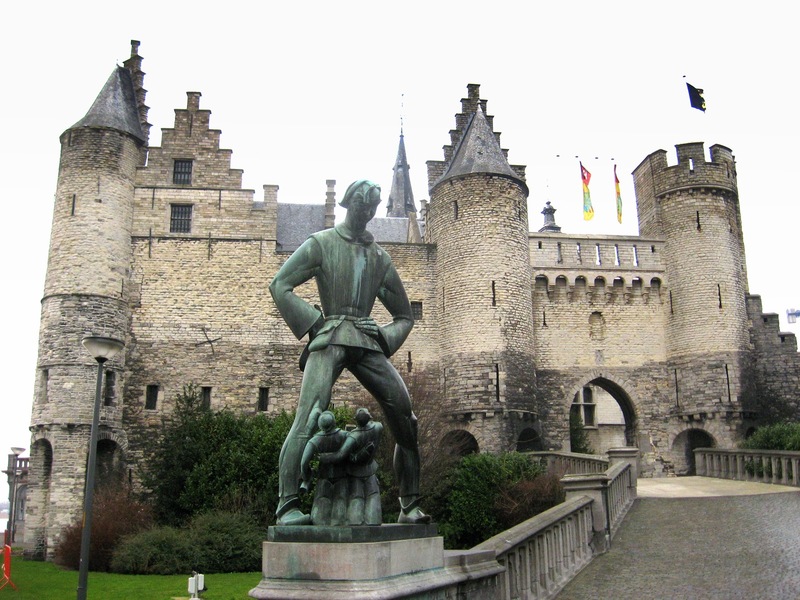 The statue at the entrance is the mythical giant Lange Wapper. He stands menacing over two drunken sailors who are leaning back to see him. According to local legends Lange Wapper used to live in Het Steen. He could make himself so tall that he could move from one town to another with a single giant leap. He liked to torment people, for instance he used to chase the drunk and used tricks to approach women to get their breast milk. Thanks for another grand window to a part of the world I would have never seen. The street view is wonderful. I wish they had saved more, but it's nice to see something remains. They should have saved more! The waterfront is totally distorted now.